The testing procedures for breath or saliva specimens as outlined in 49 CFR Part 40 is very specific and must be followed whenever a DOT-required alcohol test is requested by the employer. These procedures, including the use of the Federal Alcohol Testing Form (ATF), apply only to DOT-required testing. Federal testing regulations require that an evidential breath testing device (EBT) approved by the NHTSA is used for alcohol testing. This machine must be operated by a trained breath alcohol technician (BAT) following the procedures set forth in CFR 40 Subpart C. The employer shall keep a current copy of the BAT certification on file as proof of required training. 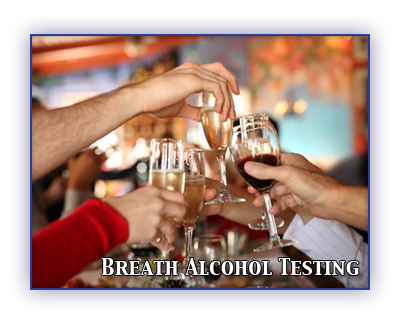 Breath alcohol tests are performed at Texas Alcohol and Drug Testing Service, Inc. by having the donor blow forcefully into the EBT’s mouthpiece for at least 6 seconds or until the EBT indicates that an adequate amount of breath has been attained. If the result is less than 0.02, the test is considered negative. If the result is 0.02 or greater, a confirmation test must be performed after a waiting period of at least 15 minutes. The confirmation test must be completed within 30 minutes from the completion of the original screening test. A new mouthpiece must be used and the EBT must be tested to assure proper registering. The BAT shall report all results to the employer in a confidential manner. This report may be in writing, in person, or by telephone or electronic means. If the result is positive, the BAT must ensure immediate reporting of the results to the employer to prevent the employee from performing a safety-sensitive function. If the company policy requires termination, the employee may be terminated but must still be referred to a substance abuse professional. If the company wishes to continue an employment relationship with the employee, the employee must be removed from safety-sensitive functions and referred to a substance abuse professional for evaluation and treatment. If there is a non-safety-sensitive job available, the employee may be allowed to work in that function until evaluation, treatment, and a return-to-duty test have been completed.